This Veteran’s Day (November 11, 2015), if you’re a military veteran, active duty military, or the current spouse of active duty, Starbucks will be giving you a free tall brewed coffee. No identification is required. 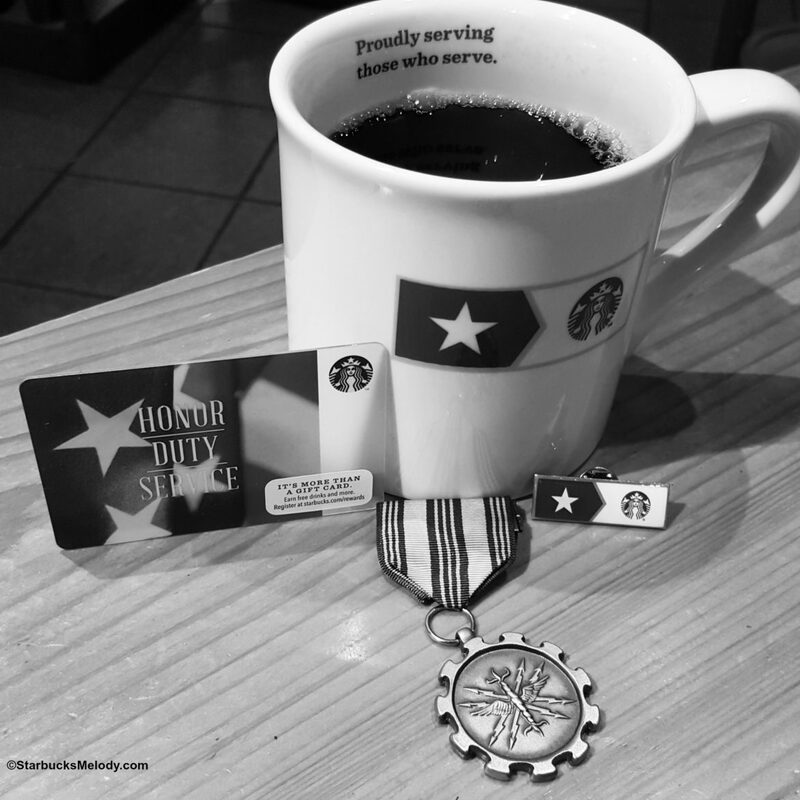 Starbucks wants to thank you for your service and sacrifice. Thank you for doing this Starbucks! 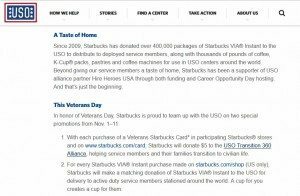 Starbucks offered this last year too, highlighting their hiring initiative to hire 10,000 military veterans (and/or military spouses) by the year 2018. Only a very small percentage of Americans have ever served in the military. I’ve heard a lot of different numbers about the percentage of Americans who have ever served. This website sites that the total percentage of Americans who have ever served is under 8 percent – and if you look at gender, far fewer women are veterans than men. 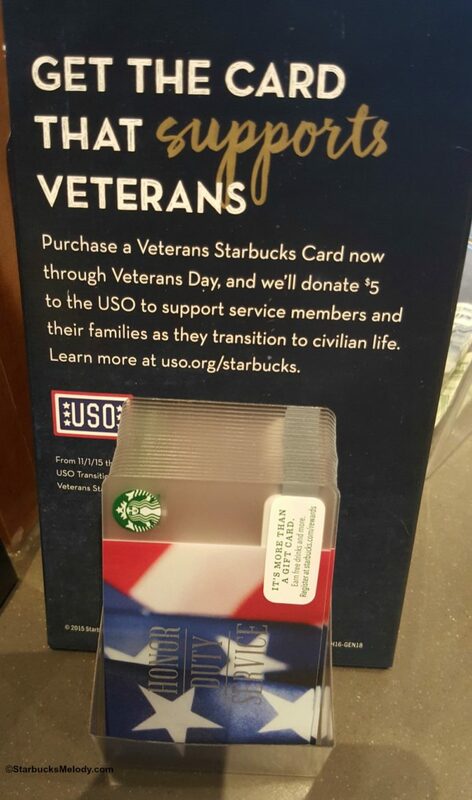 From November 1st through November 11th, each time you purchase a Starbucks Veterans card (it must be activated with a minimum of $5 on it) Starbucks will donate $5.00 to the USO Transition 360 alliance. The USO Transition 360 Alliance is an initiative to help U.S. military personnel and their families successfully transition back into civilian life after their service ends. 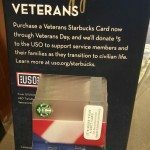 The USO website also says that when you buy Starbucks Via Instant Coffee (online only at StarbucksStore.com), Starbucks will make a matching donation of Via Instant Coffee to the USO for delivery to active duty military. I hope the USO website is right! I haven’t heard about this elsewhere, but I sure hope the USO website is right! To all the veterans reading this and their spouses, thank you for your service! Starbucks Stories told via Pictures. Fun with mango and caramelized honey: 10 drink ideas. Cool Down: 10 Unique Shaken Summer Drinks! A few ideas from MyStarbucksIdea.com – Daly City Starbucks closing? Melody, thanks for your service and thanks for the informative post. 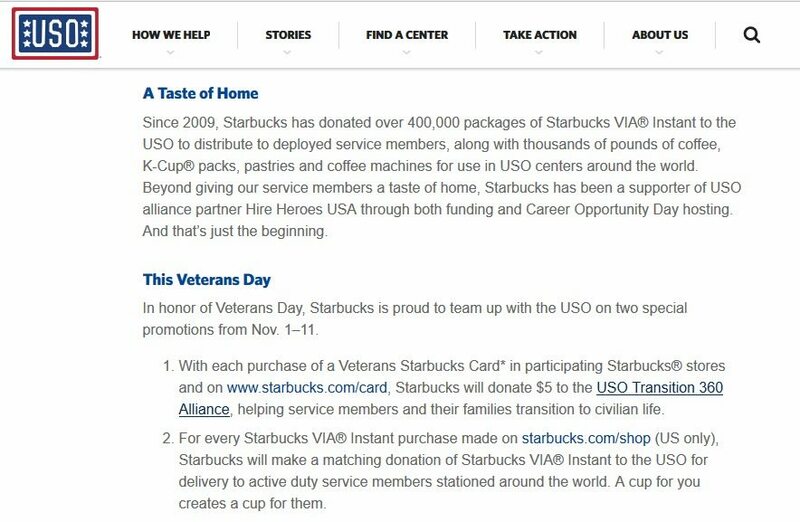 I am particularly pleased that Starbucks has partnered with the USO. Several times during my Navy career the USO was there for me and my wife when we needed them. Nice of them to do that. When I read an article as wonderful as this I cannot decide whether to shake my head or smile as I think about all the foolishness that is posted from time to time on the internet about Starbucks’ “dislike” of the military. This clearly is not true… on so many levels. It’s nice to have a place to direct people when they need “the real truth”, and StarbucksMelody is that place. Can you clarify if the free coffee applies to spouses of active duty as well?